Many moods of Lake Gairdner.. 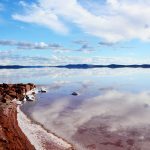 Many moods of Lake Gairdner, a large endorheic salt lake in the Australian state of South Australia, to the north of the Eyre Peninsula located in the Gawler Ranges National Park. When in flood, the lake is considered the third largest salt lake in Australia. This remote and arid country is a unique environment with changing seasonal colours creating its many moods, making this place a photographer’s dream.. 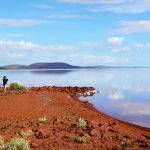 The irregularly shaped Lake Gairdner is about 160 km long and it covers an area of roughly 4,300 sq km.. There are also several small islands within the lake and in some parts the salt is over 1m thick. The changing landscape of Lake Gairdner creates many moods and when calm, has a mirror like surface that offers amazing reflections. After the rains, when the lake is filled with water, you can venture out on the lake and appear to be walking among the clouds. The incredible reflections on the lake of the sky, clouds, beautiful sunsets and clear starry nights offer great photo opportunities. The red slopes of the Gawler Ranges clearly define the shores of the lake in the south creating stark contrasts. Walking out on the lake when it is dry you can experience the crunch of the salt crystals underfoot, look north to see and endless white plain and feel like you are in Antarctica walking on the snow and ice. The stunning scenery, with its vibrant landscapes of red dunes along the lake covered with flowers in spring, unique vegetation and bird life, create endless photo opportunities. In Spring, you can see an abundance of wildlife and the surrounding plains are carpeted with wildflowers, grasses and salt bush that flourish after the rains. The first recorded sighting of Sturt’s Desert Pea, South Australia’s floral emblem, was made here in 1839 by Edward John Eyre during an early exploration of the region. In late Autumn and Winter the park is green and cool, perfect for campfires and bush walks. After the rain, the creeks flow into the lake and it looks like an inland sea alive with wildlife. Lake Gairdner in the Gawler Ranges, formed over 1500 million years ago as a result of volcanic eruptions with ancient ranges, deep gullies, seasonal waterfalls and rocky gorges, is a majestic natural wilderness waiting for you to explore. Once a year, at the end of summer, the lake gets very busy when the Dry Lake Racers have their race week however the event depends on the weather. The surface of the lake has to be firm and dry and permission of the South Australian Department of Environment and Heritage (DEH) has to be granted for the event.